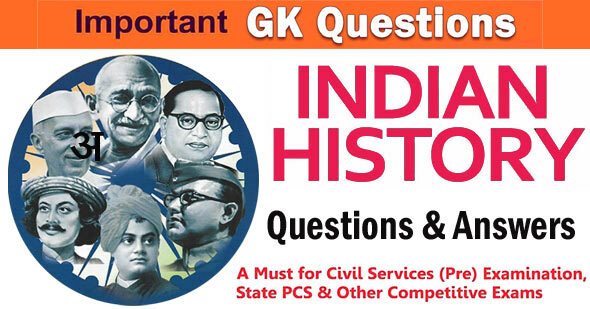 Important Indian History Questions and Answers for General Knowledge of SSC CGL, UPSC, IBPS, MAT, CAT and other competitive exams. 1. Who said the following ‘‘the British empire is rotten to the core, corrupt in every direction and tyrannical and mean’’ ? 3. Who founded Indian National Congress on 1885 ? 6. Who among the following never became President of the Indian National Congress ? 7. Which of the following may be considered drawbacks of the early phase of the Congress activities ? I. Preservation of caste and communal considerations presenting mass involvement. II. It was confined to the educated middle class. III. No proper understanding of the exploitative nature of British economic policies. IV. Misplaced faith in the benevolence and fairmindedness of the British rulers. 8. Who was the first Englishmen to preside over a Congress session? 9. Who is known as the Father of Indian Unrest ? 12. Who attended the imperial durbar of 1877 dressed in hand-spun khadi ? 13. Who was the President of Indian National Congress at the time of independence ? 14. In which of the following session of Indian National Congress the resolution of Swadeshi was adopted ? 2. March from Sabarmati Ashram to Dandi. 16. When did the British pass a law making it an offence to preach nationalism ? 18. Which of the following events was the last in chronological order? 19. Which of the following Muslim Leaders was not one of the founding fathers of the All India Muslim League ? The first President of All India Muslim League was Agha Khan III!